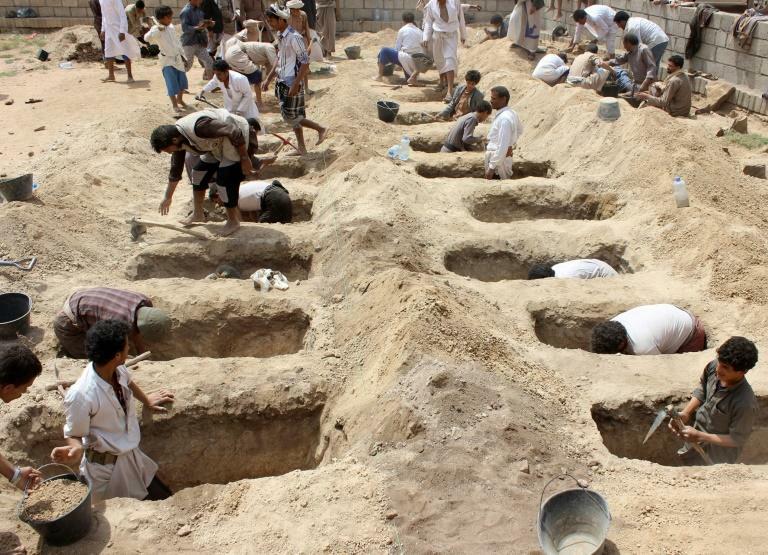 The Saudi-led coalition fighting rebels in Yemen admitted Saturday that "mistakes" had been made in an August air strike that killed 40 children. The bombing on a crowded market in part of northern Yemen held by Huthi rebels killed a total of 51 people, according to the Red Cross. Fifty-six children were also among the 79 people wounded in the August 9 strike on Saada province, a stronghold of the Iran-backed Huthis bordering Saudi Arabia. The incident sparked a wave of international anger and calls by the United Nations Security Council for a "credible and transparent" investigation. Coalition spokesman Mansour al-Mansour said a coalition probe had found that errors were made prior to the strike, and called for those responsible to be "punished". He told a press conference in Riyadh that "an order had been given not to target the bus, which was among civilians, but the order arrived late". Another error was that "the target did not pose an immediate threat and that targeting the bus in a residential area was unjustified at that time," he said. The coalition had claimed to have targeted a bus carrying rebels. Mansour repeated Saturday that the bus had been "transporting Huthi leaders" according to information from intelligence services. But he admitted the strike had "caused collateral damage". The coalition has been accused of committing numerous blunders in Yemen. It has recognised some of them, but regularly accuses Huthis of hiding among civilians or using them as human shields. The Saudi-led coalition intervened in Yemen in March 2015 after the Huthis ousted President Abedrabbo Mansour Hadi's government from the capital Sanaa and seized swathes of the country. The devastating conflict has since left nearly 10,000 people dead and sparked what the UN has described as the world's worst humanitarian crisis. The world body is set to host Yemeni government and Huthi delegations in Geneva next week for talks aimed at charting a path towards reviving UN-backed negotiations that broke down in 2016. Both sides have expressed pessimism ahead of the meetings, but Yemen's foreign minister said Saturday the government would use them as an opportunity to push forward trust-building measures. Most importantly, Khalid al-Yamani told the Saba state news agency, the government wants progress on "the release of detainees and abductees, ending sieges of cities, facilitating the delivery of humanitarian relief and paying civil service salaries" in rebel-held areas. UN investigators said Tuesday that all sides in Yemen's conflict may have committed war crimes, highlighting deadly air strikes, rampant sexual violence and the recruitment of young children as soldiers.